A solicitor by profession, scientist by education, and historical martial arts hobbyist by choice, Adrian Tchaikovsky is best known for his Shadows of the Apt series – epic fantasy laced with steampunk and other influences. 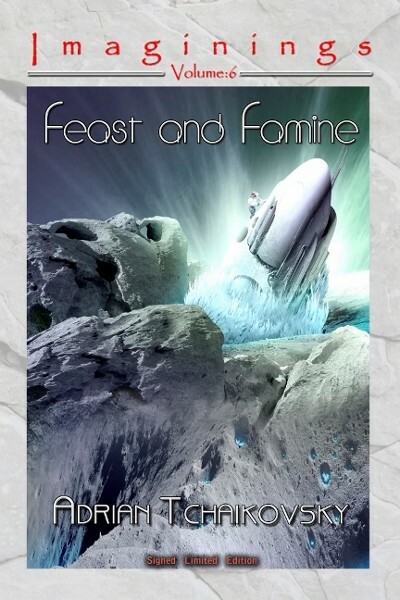 In Feast and Famine he delivers one of the most ambitious and varied collections of stories NewCon Press have yet published. Ranging from the deep space hard SF of the title story (originally in Solaris Rising 2) to the high fantasy of “The Sun in the Morning” (a Shadows of the Apt tale), from the Peter S Beagle influenced “The Roar of the Crowd” (original to this collection) to the supernatural Holmes-esque intrigue of “The Dissipation Club”, Adrian delivers a dazzling array of quality short stories that traverse genre. Ten stories in all, five of which appear here for the very first time.